BirdEye Launches Presence & Reputation Diagnostics Tool for Businesses in U.S.
Scan Your Business app enables any business to run an instant report of how their business appears on 50+ consumer sites. Most businesses do not know how they appear online. BirdEye, a leader in Reputation Marketing, launched today Scan Your Business, a free app for businesses to quickly assess their online presence and business reputation on 50+ sites. A business owner simply enters the business name and zip code, and the app generates a detailed report of their online presence and reputation. The Scan Your Business app is a useful tool for any business to check its snapshot across 50+ sites — Is the business listed on the main sites? Is the business information (NAP or business name, address, phone number) accurate on all sites? Is the business rated well (customer reviews and ratings)? The report can be instantly downloaded and emailed. Scan Your Business app is available at http://birdeye.com/scan-business/. The BirdEye Business Reputation Marketing platform can be previewed at http://birdeye.com. BirdEye (birdeye.com) is a leader in Business Reputation Marketing (BRM). The BirdEye platform helps businesses get more word-of-mouth referrals, leads, and repeat customers. 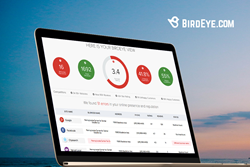 With BirdEye, businesses monitor reviews from all major sites, gain new authentic reviews, manage customer feedback, and automatically promote their good reputation across the web, social media and search engines. Enterprises use BirdEye analytics and competitive insights gleaned from customer feedback to fine-tune products or services to breakout from the pack. The BirdEye platform powers 500K businesses and 10M+ reviews. Based in Sunnyvale, CA, BirdEye was founded by alumni from Yahoo, Google, Amazon and Cisco.